A VOX is is a bugging and spying device which transmits wireless voices and sounds to a matching receiver. It transmits only while there is a sound as a voice or similar in proximity, and during duration of quietness it stops transmitting it turns to standby. This way, the battery lasts for a long time. This micro size spy bug spying device, monitors the room or any place in wireless mode. The UHF transmitter transmits on the UHF band and the output is approximately 25mW (in 50 Ohms antenna). 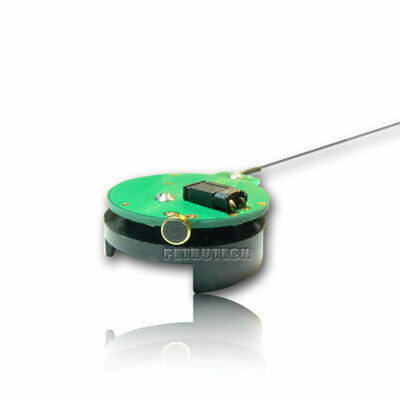 It uses the most modern and professional micro controller, for achieving excellent performance. The longest distance that may be achieved, is 600 m in open field, line of sight, when there is an imaginative line connecting the transmitter and receiver (tested with ICOM IC-R20 or our special receiver PETRU433 ). 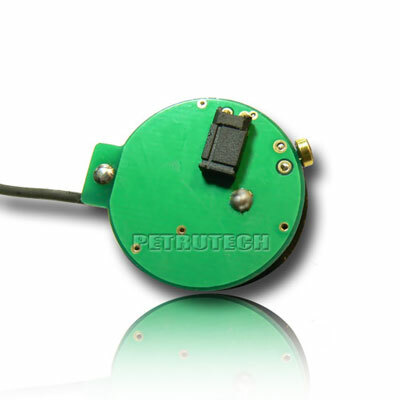 Professional and efficient PROGRAMMABLE, miniature UHF VOX ACTIVATED AUDIO surveillance transmitter. The frequent problems with standard bugs are short battery lifetime and low output power. VOX33S offers an incredible long battery lifetime, due to the voice activation feature. If there are no sounds and voices, the transmitter remains in standby mode. During the inactivity, when it is in standby mode, it draws less than 1 mA, which is almost nothing. However, when a sound or voice is picked up by its sensitive microphone, it turns on in transmission mode. 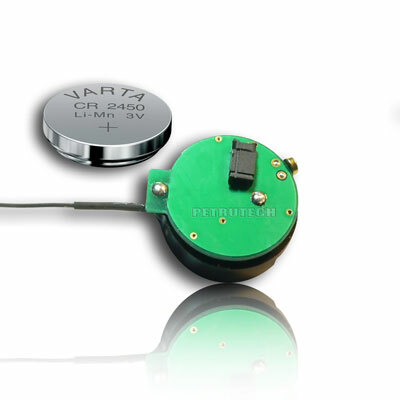 This programmable voice activated bug can use a button type battery as: CR2450 or CR2430. If using CR2450 batteries - in transmit mode (non-stop transmission) the battery lasts for approximately 24 hours, and in standby mode, approximately 960 hours (or about forty days)! It is exceptional to be used as a device for room monitoring, baby listening, nature studies, and so on. The super-sensitive miniature microphone, the high frequency stability (PLL quartz oscillator), and the endless frequencies that can be programmed, makes it the best device you may find. The frequency is programmed, and cannot be modified by the user. However, upon request, we are able to program it to almost countless distinctive frequencies. The VOX33S transmits a very powerful, clear sound. The transmitter is designed and tested in our specialized laboratory and tested as well "in real conditions" by excessive professional engineers for maximal distance. PCB Size: The size is only 2.45 cm diameter..
Transmitter's frequency range: NFM (UHF) 400-500MHz CRYSTAL STABILIZED Programmable in our lab. Long transmitting range: up to 600 m on clear. (L.O.S). Special powerful design. EXTRA amplified, high power output! 1 Crystal controlled PLL PROGRAMMABLE VOX33S Voice activated VOX SPY BUG Transmitter. 1 Battery holder for CR2450 (Battery not included).